Earn 1800 loyalty points when you order this item. Meridian DSP3300 DSP Active Centre Speaker is ingeniously engineered to be versatile within your home, an ideal building block in a compact Meridian system. The DSP3300’s precision-manufactured cabinet includes a rubber mount, enabling the speaker to be placed horizontally or vertically with no reduction in sound quality. The design is also suitable for wall mounting. 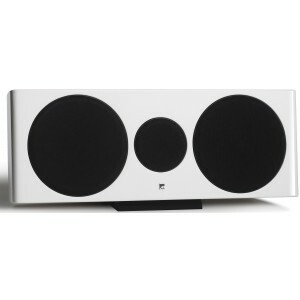 This speaker can also serve magnificently as the ideal centre channel, to complement a pair of compact and elegant DSP3200s or M6s. Used in a surround sound system, the smooth-lined DSP3300 will expertly handle any of the front, centre channel, and surround duties. A testament to the effectiveness of our pioneering DSP technology, even the compact DSP3300 cabinet houses three drivers, plus the advanced electronics necessary to deliver room-filling sound equal to the performance level of a conventional speaker four times the size. Filters are critical in digital audio. Commonly they introduce distortion and harshness because of "pre-ringing". Early digital recordings suffer from harshness too, due to primitive filters. After painstaking research, Meridian developed a special filter that avoids pre-ringing, so it can be steeper, cleaning up the effects of early filters for a better, cleaner sound from recordings old and new. The goal is to have time-accurate loudspeakers, where all reproduced frequencies start and end at the same time. In a loudspeaker, this timing is affected by the crossover, driver, and enclosure type. To eliminate the delay between low, and mid and high frequencies, Meridian has designed a combination of digital filters and time delays for the mid and high frequencies. This solution enables the mid and high frequencies to “wait” for the low frequencies, delivering perfectly-timed music playback. Mid and high frequencies are delayed to time-align them, while upper bass is delayed with a special type of patented filter. These features must be implemented entirely in the digital domain, making them impossible to achieve in any passive or analogue-active loudspeaker design. Enhanced Bass Alignment provides accurate time-alignment of the drivers in the system, delivering exceptional imaging and a clear, transparent, more lifelike sound.